As many of our patients know, important changes have been made to HBF’s health insurance dental cover for 2019. HBF recently terminated all preferred provider agreements with Dental practices and have instead introduced a Members Plus Dental arrangement. 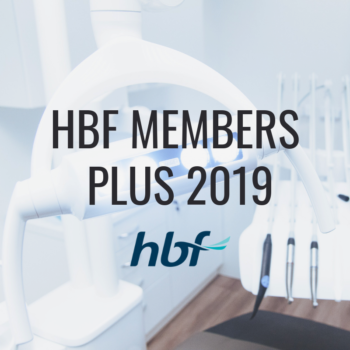 Although General Dental and Major Dental won’t give as much back, HBF are giving their members more back on Preventative Dental treatments like cleans and exams. You and your family can receive a fully covered scale and clean per calendar year depending on the level of your Essentials cover held. For other preventative dental services, you can receive from 70% to 100% benefit, depending on the level of your Essentials cover. When did these changes come into effect? HBF notified patients and Dental practices in November 2018. The new policy commenced on the 1st of January 2019. What should you do if your new benefits and limits do not meet your needs?If you feel your cover is no longer meeting your needs, we recommend contacting HBF directly and discussing your options. Otherwise you can talk to one of our staff members for further advice. If I was quoted in 2018, will Aim Dental still honour this quote?Aim Dental will certainly honour a previous quote created by us, however HBF rebates will be different. If one of our staff members put your HBF card through the HICAPS machine to give you the estimated Gap Payment. That amount will be different as this is related to your Health Fund. How will this affect me if I am going through orthodontic treatment?If you are currently receiving orthodontic treatment, you may have already received your benefit as HBF usually pays this on your initial visit or first date of treatment. If you commence your treatment after January 1st, 2019 new benefits and limits do apply. If you are concerned that these changes may affect your cover and would like your treatment re-quoted, you are welcome to head into the practice and we can re-swipe your card. Alternatively, we recommend contacting HBF directly. For more information on the recent HBF changes, head to the HBF website. For more information on health insurance benefits we offer at Aim, click here.